Some people’s career path resembles a seismometer readout during a major earthquake. Sausal Restaurant chef and owner Anne Conness qualifies as one of those. She was successful at several different things before following her passion into the culinary industry, where she has pioneered some remarkably diverse dining experiences. Her passion for all things culinary comes from her father, who was a “foodie” long before that name was invented. Cooking professionally wasn’t on her radar then, though, and she took a while to get there. Conness moved to New York to become an artist, specializing in abstract work. A day job painting movie sets led to job offers in Los Angeles, where she painted sets for TV shows and then started doing other work in the industry. This included producing short music pieces for an animated character named Michigan J. Frog. She also put her writing talents to work, not in scripts but promoting various shows. Then, feeling that something was missing in her life, she decided to take another career turn. Sausal tamale topped with crema and pomegranate seeds over beans. One day she met Mike Simmis, who was to be quite important in her life. He was looking for a chef for a restaurant he was building in called Tin Roof Bistro. 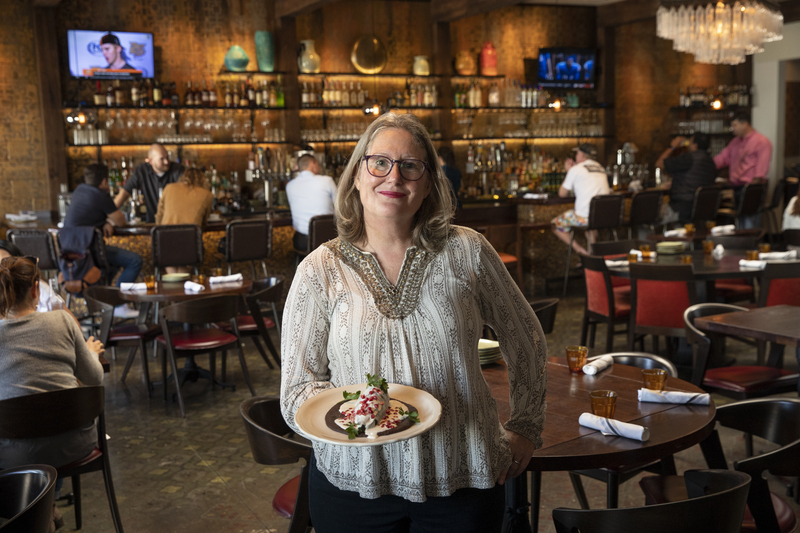 Anne signed on as chef-partner and started developing a menu inspired by Napa Valley dining, but construction on the building, in the Manhattan Beach Village Mall, was delayed due to permit problems. Simms took advantage of the delay by asking Anne to develop the menu at another restaurant he was launching, an upscale burger and beer spot called Simmzy’s. Anne was initially unenthusiastic about the idea, but she warmed to the challenge. Putting that rather obscure type of pickle on the burgers may have thrown some people, but it gave the burgers a distinctive flavor that was a key to Simmzy’s success. The restaurant in downtown Manhattan beach boomed from day one. Then it was time to get to work on Tin Roof. Tin Roof’s wine country focus was a hit, but the time creating the menu for Simmzy’s had given her an interest in other beverages. She became a certified cicerone, the beer equivalent of a sommelier, and one day had a revelation. She found the perfect spot on Main Street in El Segundo, and a conversation with a friend led to a refinement of the concept. California cooking before the American takeover in 1846 was related to Spain and Mexico, but different in many details. Among other things, Alta California was the cattle ranch for the Spanish empire in the New World, and they developed a variety of long-simmered beef specialties. Grapes grew here well, too, so they created wine sauces that are unknown in Mexico. Since Sausal opened in 2015 most diners have been delighted with the unique flavors, but some have been confused. The same was true for the back of the house. Conness had to show a largely Hispanic team how to make a variant on their own cuisine that they didn’t know existed. Meanwhile, Conness was getting interested in a completely unrelated cuisine. “In 2010, I went to a food conference in the Napa Valley, and I kept being drawn to chefs from the Middle East. What they were doing was at once familiar and exotic, using these spice blends… I learned so much from these Turkish guys. Then I met an Israeli chef named Alon Shaya who had a couple restaurants in New Orleans, and I wondered, how come people don’t know about this? I read Yotam Ottolenghi’s book on the subject and though I rarely connect with cookbooks, I wanted to make everything in it. I never thought I would cook in that style, at least professionally, but I did at home. The new restaurant is called Jaffa, and like Sausal there was some cultural dissonance at the front and back of the house. After opening one restaurant resurrecting a lost cuisine, and another reinterpreting a cuisine that is evolving, it seemed worthwhile to ask whether she had created any cross-fertilizations of the two. Had she tried adding labneh cheese to a burrito, or crossed a felafel and a tamale? She laughed and said that might be too eclectic even for her, but then expressed her continuing commitment to experimenting. Running two restaurants is so exhausting that Conness cherishes the time she can enjoy non-culinary activities such as working the New York Times crossword puzzle. She is careful to keep aside time to be with her wife Terri and their children. Perhaps they don’t. But then again, as a teenager neither did she.